A good vacation retreat like Rumberpon Island is quite recommended for tourists. The location is in Wondama Cape and it takes a few hours from Manokwari City using a boat. 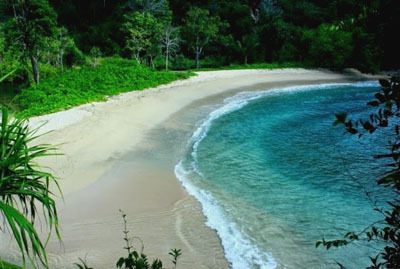 Apart from the lush trees and a serene nuance, the island is famous for its beach, which is called Pasir Panjang Beach. As the name implies, it has a long shoreline, reaching up to 6 km. Pasir means “Sand” and Panjang means “Long”. The island is popular as tourists are able to do many fun activities like snorkeling, diving, fishing, and swimming. In a nutshell, Rumberpon Island provides an excellent environment for an adventure. With lots of trees and different types of flora, people can perform a small trekking and beach walking. The fact is that the island also features mangroves and reeds, on which people can explore. Plus, visitors have the chance to meet local birds. What a great chance to get close to nature. Also, there is a beautiful beach with its white sand and calm waves. The water is refreshing, so visitors are likely to swim there. Once tourists get to the island, they may see stunning white sand and crystal clear water in the coastal area. The sloppy beach and calm waves make it more comfortable for tourists, in fact. Rumberpon also offers various nautical creatures! Not to mention corals are seen underwater, so the island is suitable for both diving and snorkeling. The most famous spot is 9-reef flat that is also famous among foreigners. For those who don’t like diving, other fun activities are available like fishing and surfing! It is even possible to do water skiing. Not only tourists, some researchers also often visit Rumberpon Island. They conduct an observation of local animals and birds in the location. The most popular ones are kuskus and sea eagles. Those exotic animals are beautiful and unique, so tourists feel lucky when encountering them. Another famous animal is Cervus Timorensis or “Burung Rusa”. The birds can be found in the reeds, but they rarely appear. What’s more? There is also a formation of seagrass, on which sea turtles live. Another important habitat is the mangroves, which is located near to the beach. It is worth an exploration, as well. As for tips, tourists should wear comfortable clothes when spending a vacation in Rumberpon Island. It is because the weather is a bit hot, especially in summer. Also, don’t forget to carry sunglasses and sunblock, especially those who want to explore the beach. If necessary, they must carry a camera to capture all beautiful moments during the adventure. Another important tip is related to accommodations and facilities. It is better to have prepared snacks and bottled water beforehand, as no facilities are available on the island. It takes some time to reach the island. First, tourists need to head to Manokwari City and the destination is Rendani Airprot. From there, their next objective is the port and rent a speedboat to Rumberpon. It takes about 5-6 hours. As an alternative, they can take a local transportation service to Ransiki and take a longboat from there to the last destination.